With Croquet Sets the old adage ‘you get what you pay for’ is generally true. The more expensive sets are generally heavier, have better quality mallets and balls and more substantial hoops which will not deteriorate so quickly if left out in British summer weather. If you are looking for an inexpensive Croquet Set which you can put in the back of the car to set up on the beach or the campsite then have a look at Garden Croquet Sets or Family Croquet Sets. These are the ones to go for if you have a smaller garden. For a larger set to play when family and friends get together then you may be interested in the 6-player Garden Sets. Look under Premium Garden Sets if you are looking for a more substantial set and would like to get closer to a Croquet Club experience. 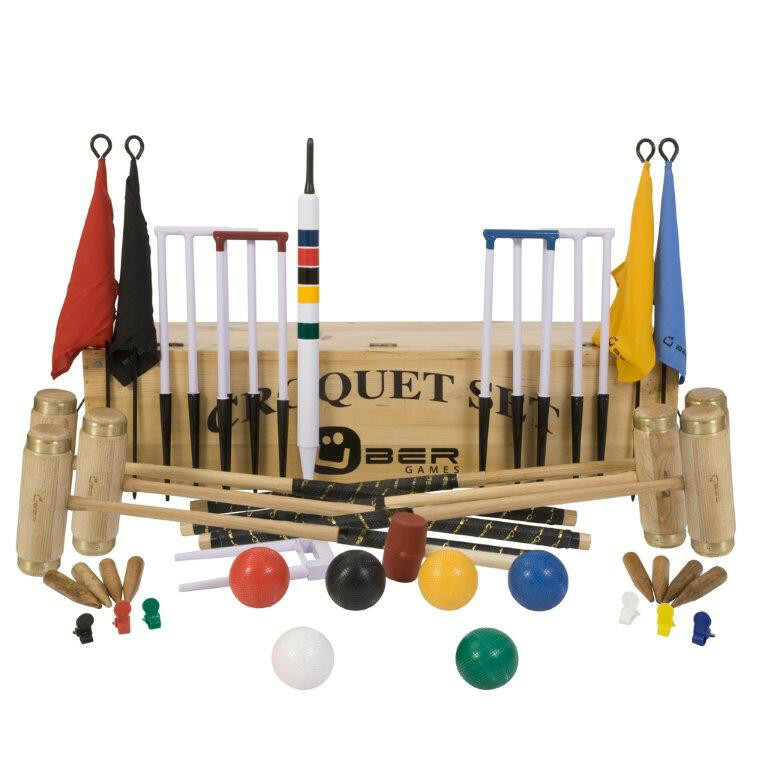 If you are setting up a social croquet club you may be interested in our Competition Sets. These have equipment designed to withstand frequent use and meet CA competition standards. • A lightweight nylon bag which is inexpensive and easy to carry single handed. • A traditional wooden box which is great for storage but adds to the weight and requires two people to carry. • A Wooden trolley which hold and displays your equipment and can be trundled out to the lawn single handed. Other things to consider are a choice of mallets lengths, whether you want hoop clips (used to indicate the next hoop for each ball) and corner flags to mark out your court or lawn. It is also worth mentioning that composite or plastic balls are a lot more durable. We also sell mallets, hoops and balls separately, to allow you to replace damaged or lost items, as well as add to or upgrade your Croquet Set. Please contact us if you would like any further information or if you would like to discuss your choice before ordering your set.